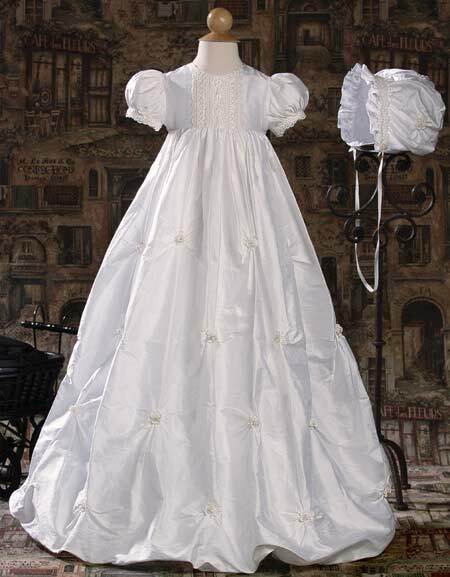 Stunningly beautiful 33" silk dupioni heirloom Christening gown with bubble hem. Stunningly beautiful champaign tinted (slightly off white) 33" silk dupioni heirloom Christening gown with bubble hem. Small gathers and venise lace pearled rosettes create a beautiful pattern across the skirt. Includes matching bonnet. 100% Silk. Dry clean. Hand made in the U.S.A. Shipped with elegant padded hanger and zippered vinyl bag. Heirloom Preservation Bag recommended for long term storage. This is one of the most beautiful gowns I have ever seen! My triplets looked absolutely gorgeous in them. I would recommend this gown to anyone looking for an elegant garment with lots of WOW factor! This is the most beautiful gown I have ever seen!! Believe me you won't be sorry you ordered it. You will be amazed at how goreous you little one will look in it! Purchased this gown for my neice. It is the most beautiful gown I have ever seen. Definatley worth the money! I have to agree with the other reviews - this is the MOST BEAUTIFUL gown I've ever seen. My daughter was gorgeous in it and we got so many WOW comments. You can't go wrong with this gown, believe me!